The ‘Discover Boyle’ Voucher Booklet is currently being distributed in various tourist locations in the area. Funded jointly by Boyle Town Team and Boyle Chamber of Commerce, the booklet features discounts in 30 businesses in the town. The pocket size 64-page booklet also features a map of Boyle and includes perforated vouchers. 5000 of the high quality publication will be distributed in Lough Key Forest and Activity Park, Local Link Bus, Shannon boat and cruise outlets and various tourism providers to encourage visitors and new customers to come and support businesses in Boyle. Participants are requested to keep a record of vouchers presented as this information will be collected by Una Bhan Tourism to compile a final report on the initiative at the end of the tourism season. 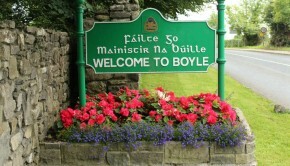 Boyletoday.com report that funding of €2000 has been warmly received by Boyle Family Resource Centre. It comes from the Applegreen Blossom Fund which is a partnership between the Irish Youth Foundation and Applegreen. It is proposed to use the money towards the “Boyle Community Garden” at the Centre which will incorporate a polytunnel that will be maintained and used by the community. The project will help with the psychical and mental well-being of those who have direct access to the garden, especially those experiencing food poverty. Boyle Family Resource Centre is one of 63 community and voluntary youth projects across Ireland which were chosen from over 300 applicants to receive a total of €124,000 form the Applegreen Blossom Fund. Smart Start Pre-school, Aughnagrange, Boyle will hold their Open Day on Saturday 18th August 2018. Parents/guardians are welcome to attend the open day from 10am until 12pm, where they will get to view the pre-school and get a taste pre-school life! Opening this September, and parents will be able to get a registration form at the Open Day. All staff will be qualified to the highest standard, and are highly experienced. We are looking forward to seeing everyone on the day. A number of events and are planned for Heritage Week in Boyle including: A Sacred Island before Christianity – Ardcarne Church of Ireland (August 22nd). Mighty Moths – King House (August 23rd). Family Nature Walk – King House (August 23rd). King’s Trail Bus Tour – Grounds King House (August 18th and 25th). ‘Gathering’ – King House (August 18th to 25th). ‘Dig It’ Archaeology for Children – Lough Key Forest Park (25th August). National Heritage Week 2018 will take place between the 18th and 26th August. Coordinated by the Heritage Council, National Heritage week is Ireland’s most popular cultural event and this year over 450,000 people are expected to participate in over 2,000 heritage events around the country. Over thirty community groups, organisations and individuals have organised more than fifty events around County Roscommon to celebrate the rich and diverse heritage that is there for us all to enjoy. Events range from lectures, launches, nature walks, visits to historic houses and gardens, music, poetry and song to family fun events. Many of the events are free and highlight the abundance of great work that is carried out in communities all around County Roscommon including Boyle to care for and promote our built, natural and cultural heritage. The annual Pete Walsh Lough Key Boat Regatta will take place on Saturday August 25th. This year’s event will be in aid of SHOUT. All are welcome to join meeting in Lough Key at the harbour at 5:00pm. Anyone wishing to come aboard on the Trinity or any of the boats will be most welcome. Shannon Academy of Irish Dance will recommence soon in Boyle. Classes will take place in St. Joseph’s Hall on Thursday 6th and Friday 7th September, All grades and ages catered for. Further information from 086 4165 042 or 086 8679 950 or shannonacademydance@gmail.com Shannon Academy of Irish Dance is committed to providing quality Irish Dance instruction and is based in Boyle & Roscommon. A Health and Wellbeing Craft Fair will be held in Boyle in September. The Fair will take place in the Spool Factory Event Centre on Sunday September 9th from 11am to 6pm. The event is open to all complementary therapists, crafters, soap makers, crystals etc but stands are sold out at present . Are you looking for a new job? Are you having difficulty putting together your CV? Would you like some help? Then why not call into the Úna Bhán office in the grounds of King House, Boyle, where we will be delighted to give you any help, advice or information we can. A good CV could make all the difference in getting your job application through to the interview stage. We have a template and sheet of helpful tips to guide you through the process. We will also type your CV if you cannot do this yourself. Or you may just want to call in for a chat about your CV. All information will be treated in the strictest of confidence. For more details, contact Úna Bhán Tourism on 071 9663033. We also offer office services such as Photo Copying, Scanning, Laminating, Typing, Faxing, Binding and Printing are carried out at the Una Bhan office in the grounds of King House, for further information.